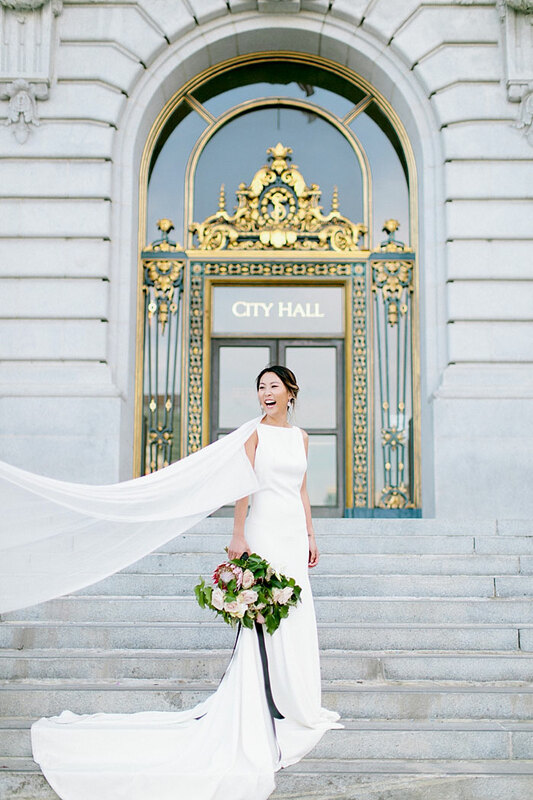 You guys, we LOVE this shoot. 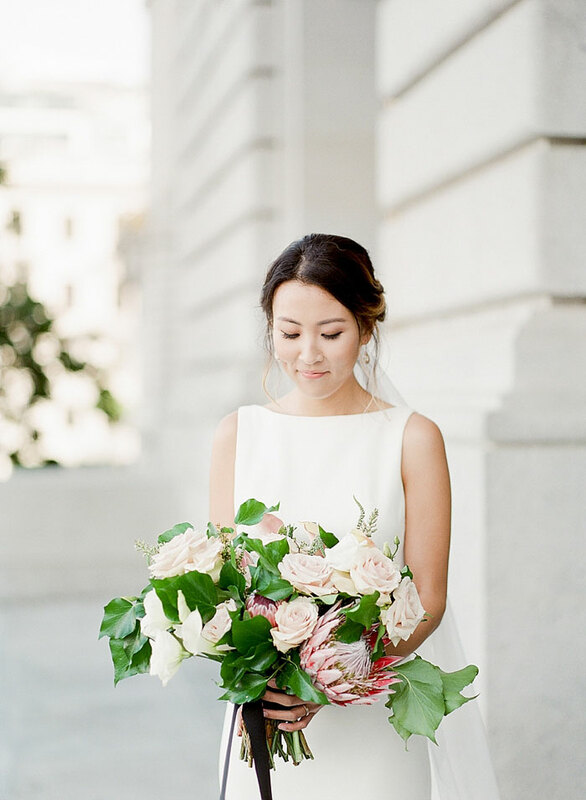 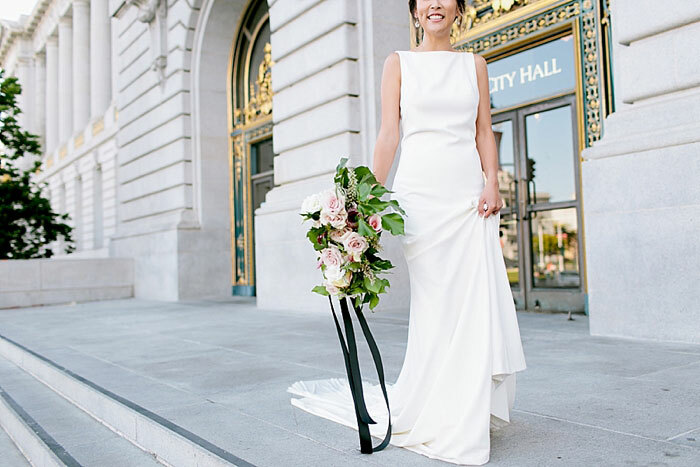 The vibe is fresh and cool with modern, feminine touches all set at San Francisco’s gorgeous City Hall and the scenic rooftop of 620 Jones. 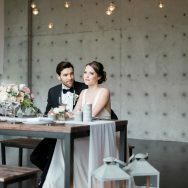 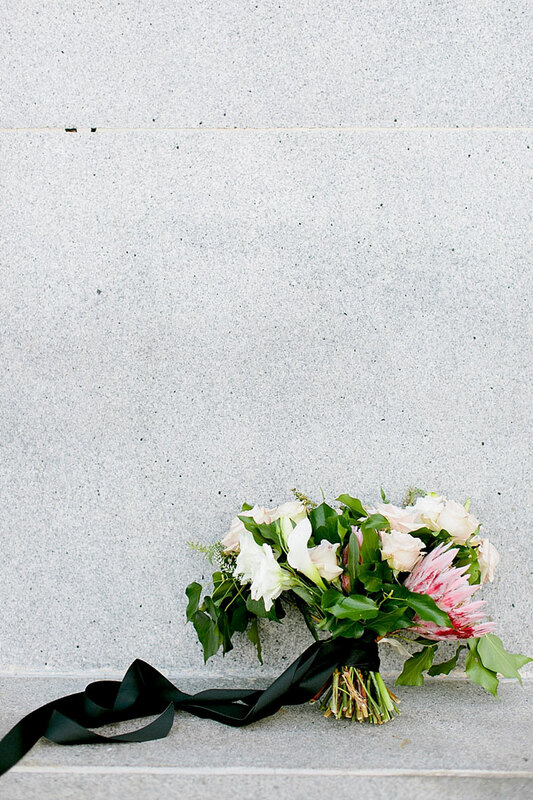 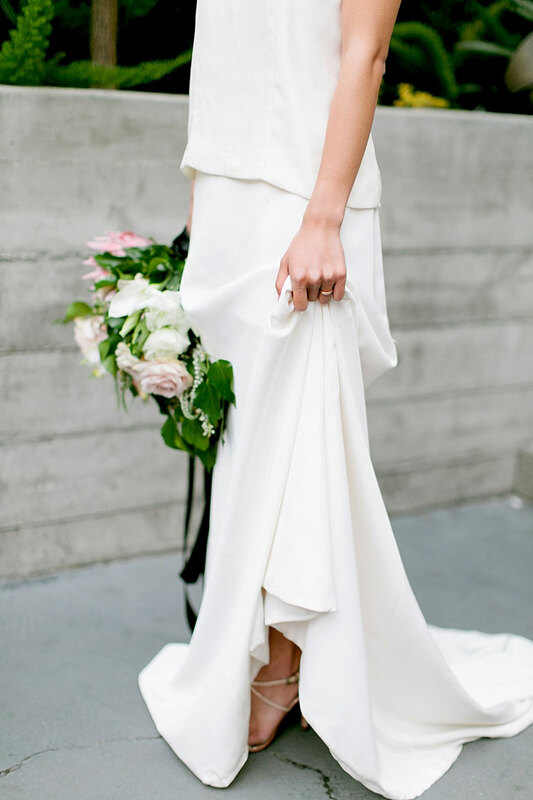 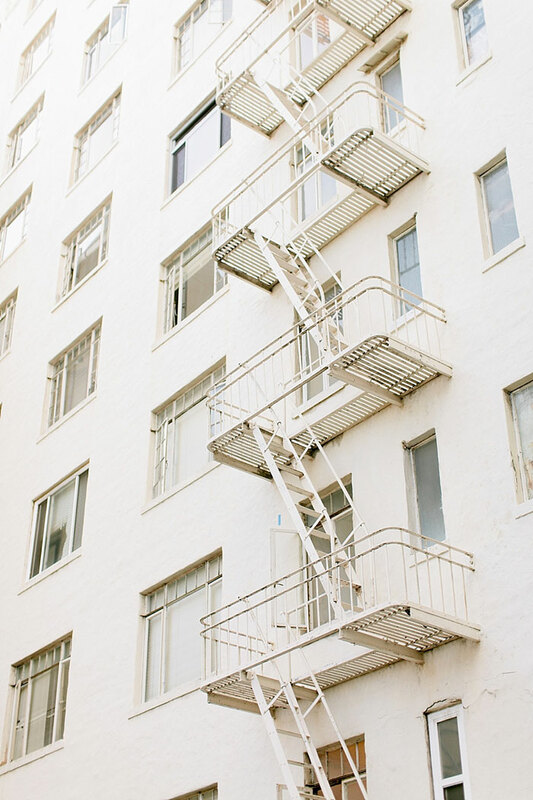 The amazing team, led by Collective member CCL Weddings & Events, focused on an organic, modern-minimalism event set in the bride’s sophisticated urban lifestyle. 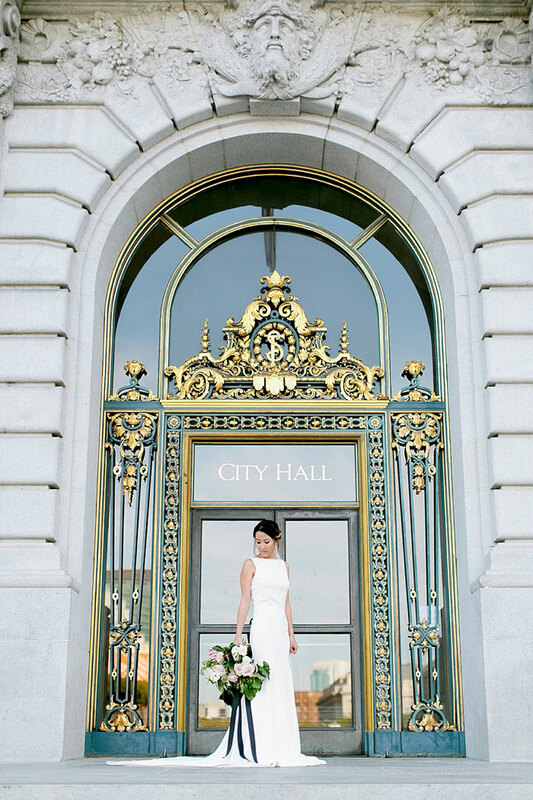 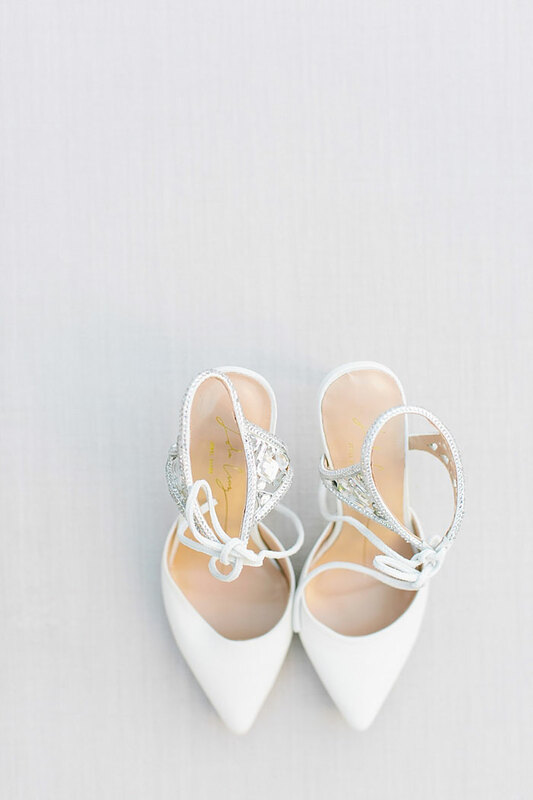 This one is for the bride who says “I do” in the center of the city. 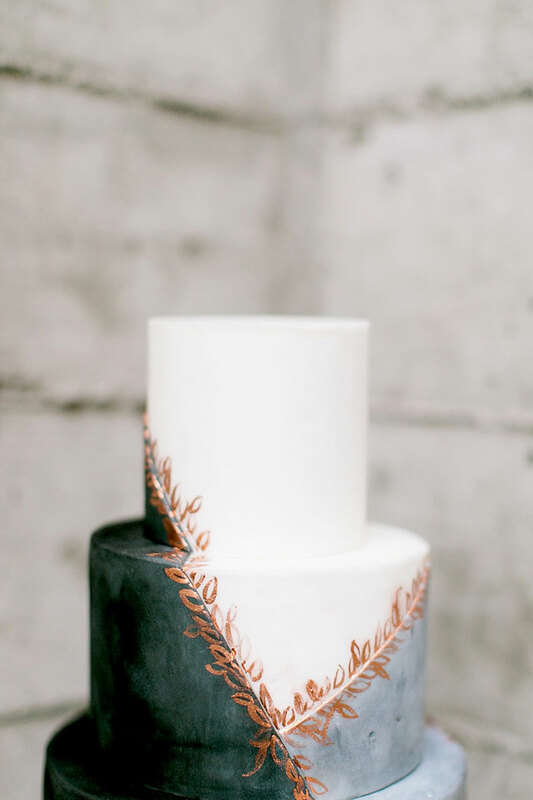 With stunning, graphic and whimsical stationery by Bowerbird Atelier and lush florals by Bloomwell Co., are feminine and timeless while the three-tier modern cake by Paper Heart Patisserie is a showstopper with it’s rose gold hand-painted detailing. 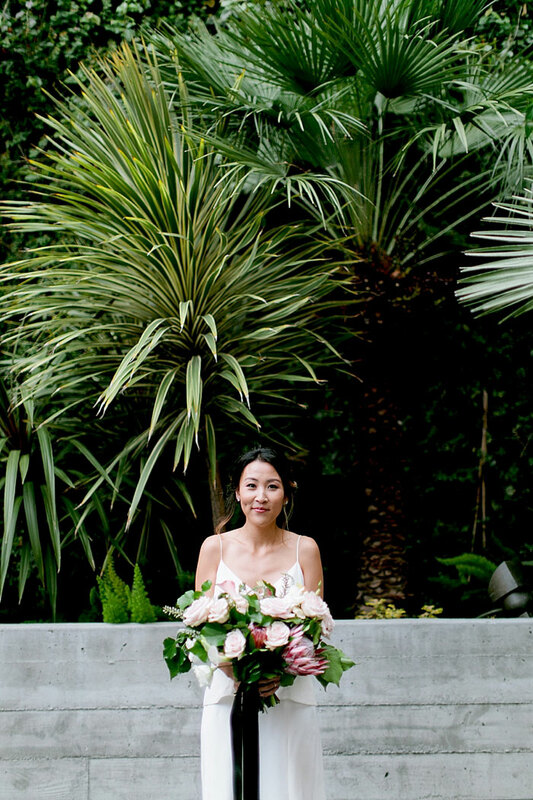 Lucky for us, Sorella Muse, and her amazing eye, was behind the lens to capture all these beautiful images for us al to lust over. 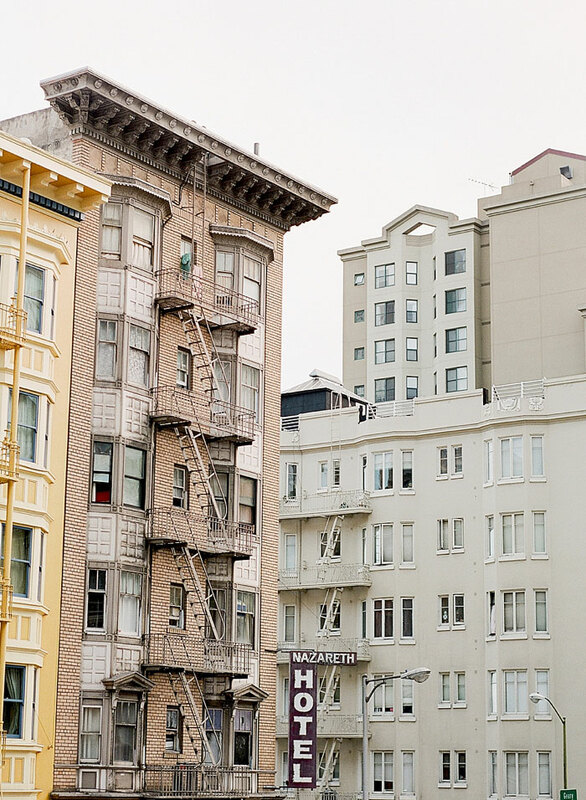 San Francisco is a city of contrasts, vibrant and refined, and known for its commitment to farm to table organic fare. 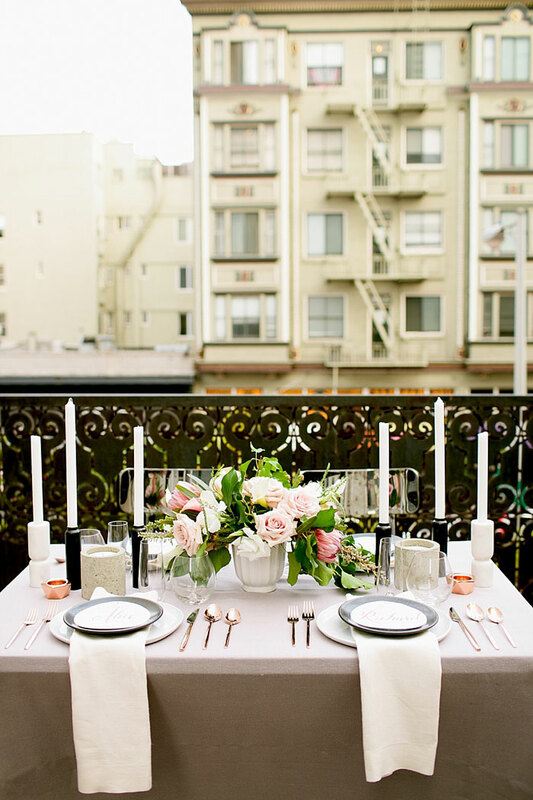 We wanted to evoke the city’s sleek modernity with a color palette of black, white, concrete, and rose gold, while bringing in more organic textures with the florals and linens. 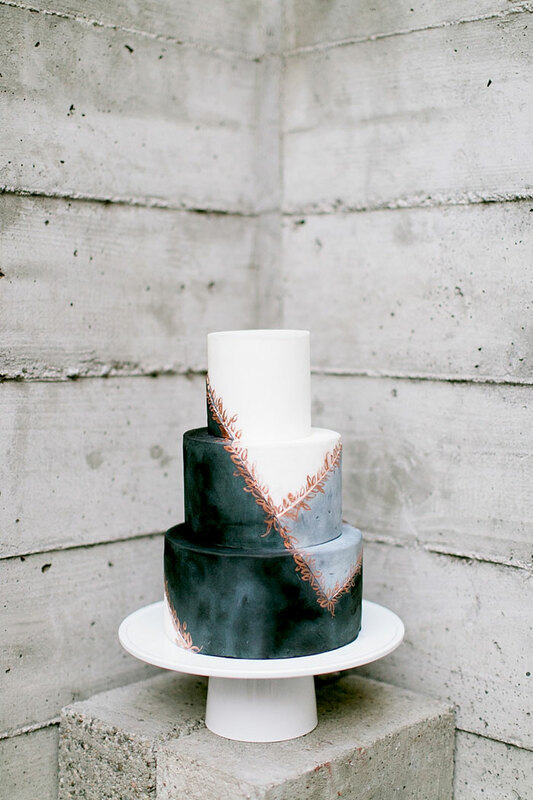 Black and white is a forever chic combination, and adding concrete gives it an industrial flair, while rose gold is having its own metallic moment! 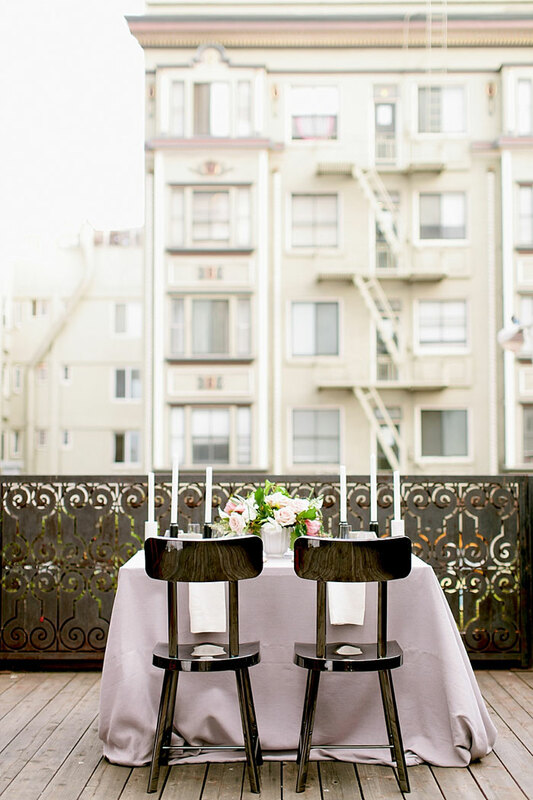 620 Jones is an elegant rooftop restaurant close to City Hall and adjoining a historic landmark building. 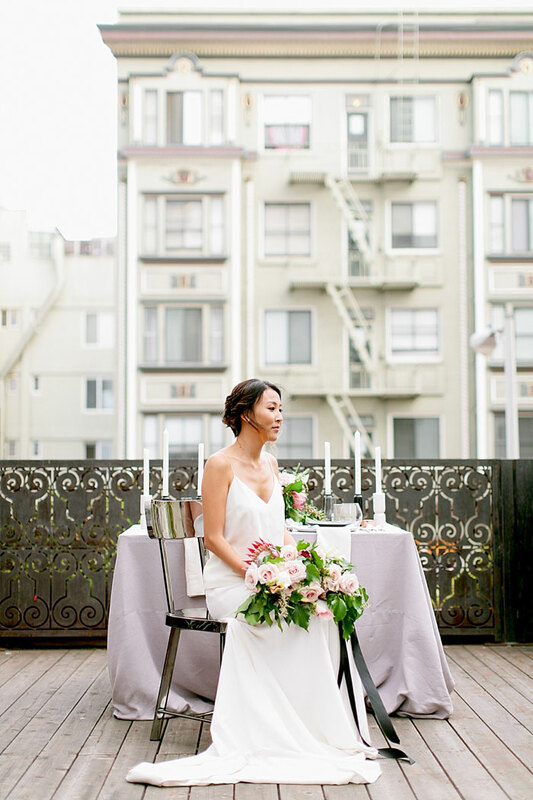 It is one of the few rooftop wedding venues in the city, and has a lovely courtyard terrace that would make for an epic reception setting. 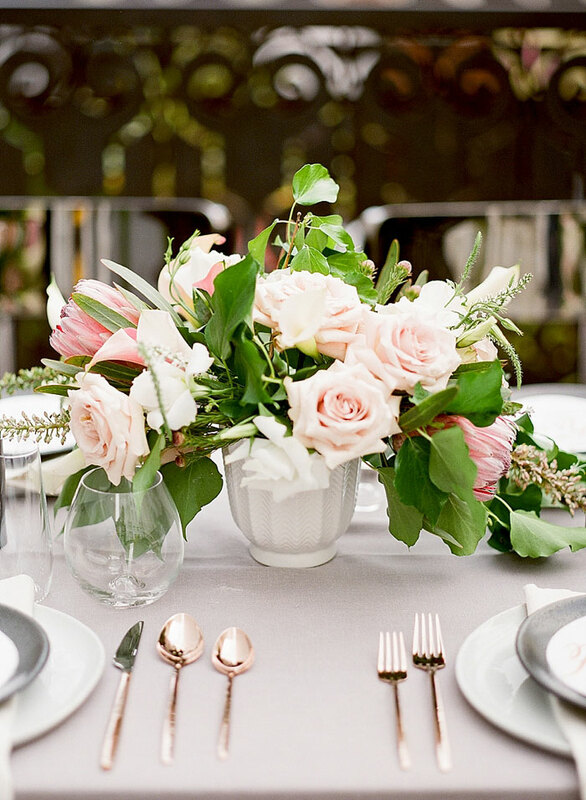 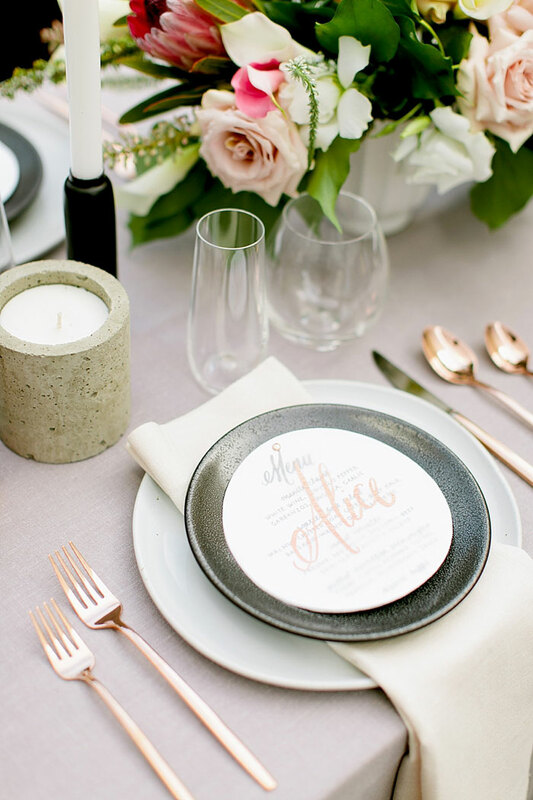 Catherine of CCL Weddings dressed the table in grey La Tavola linen with black, white, concrete, and rose gold elements. 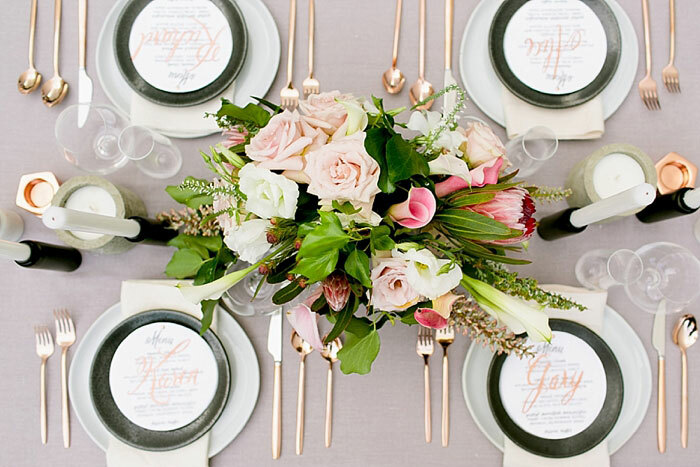 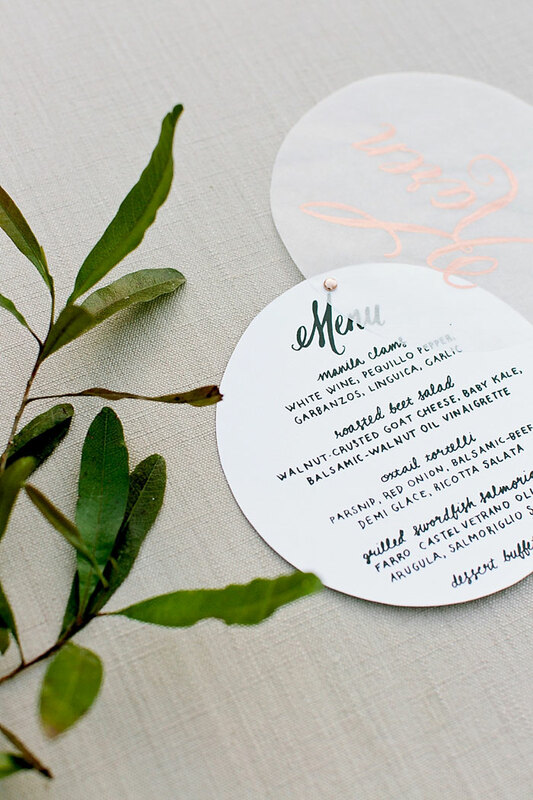 Round menus with names in rose gold calligraphed on the first page were placed over black salad plates, with rose gold flatware tying in the metallic accent. 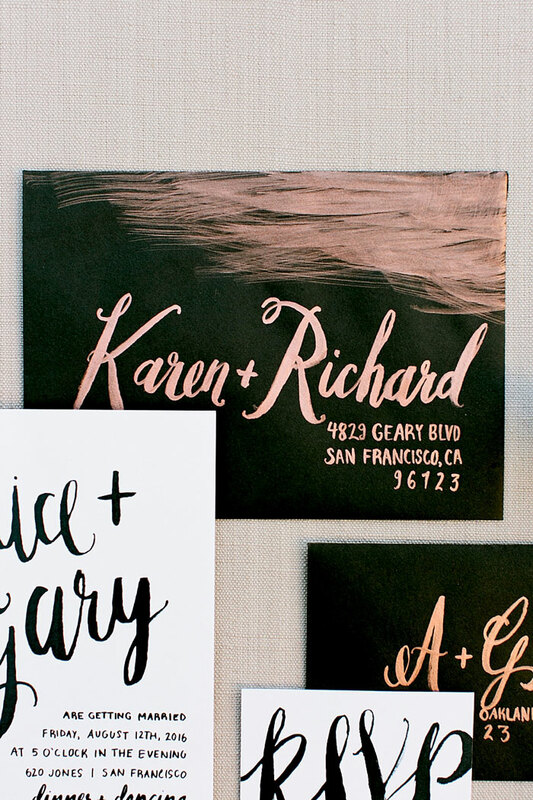 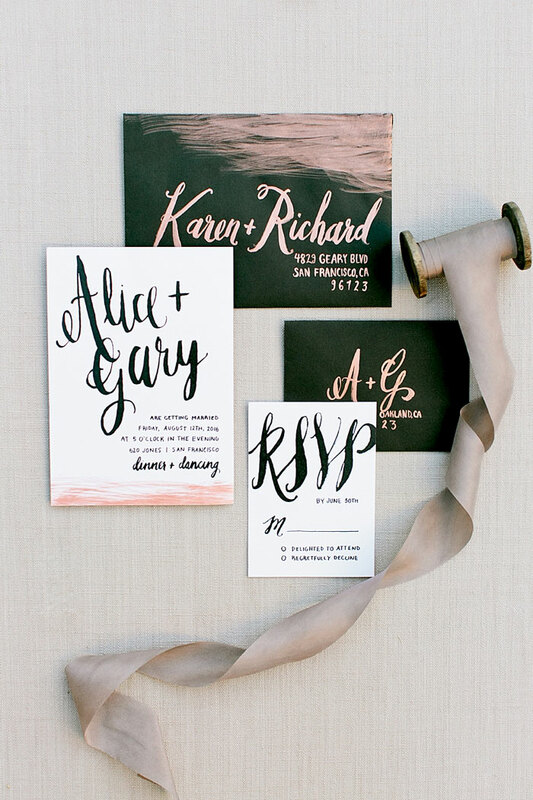 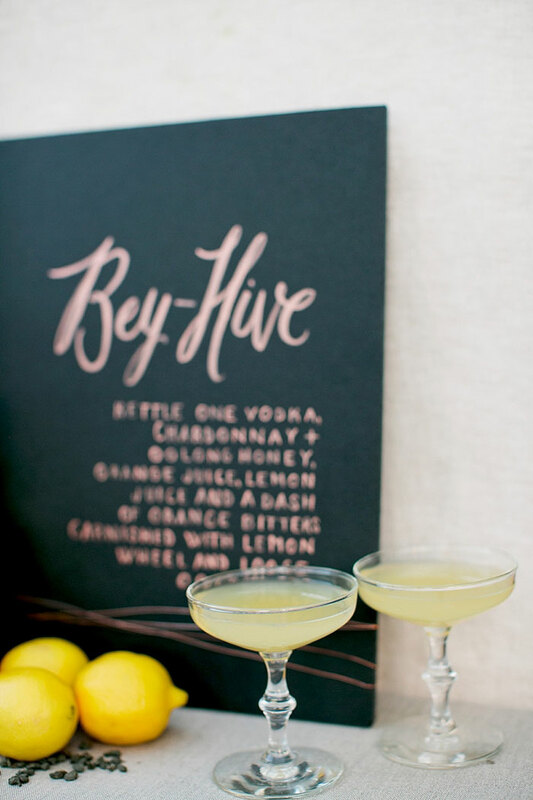 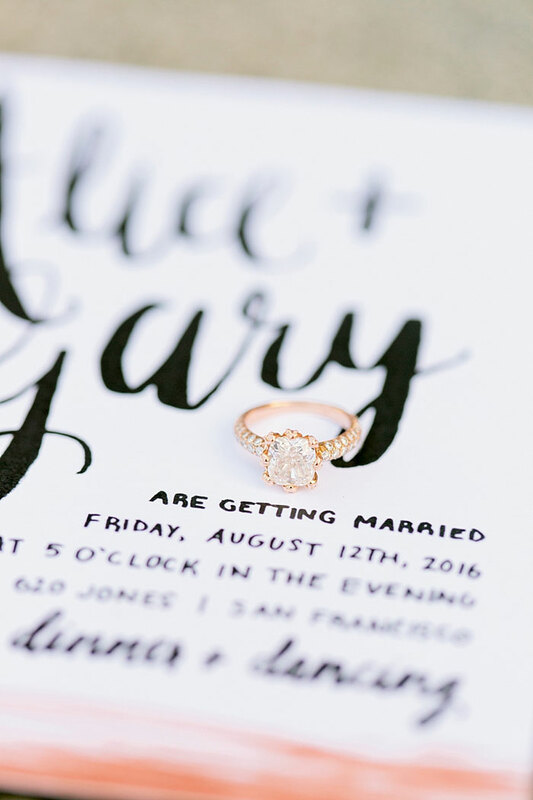 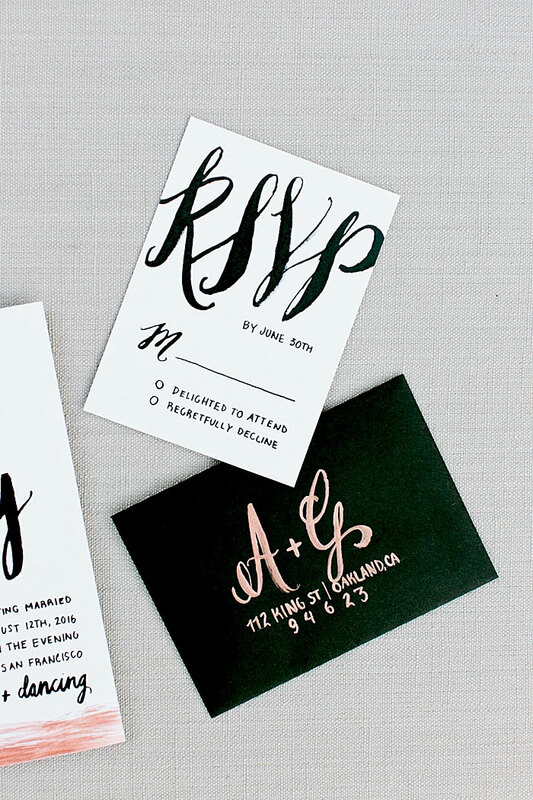 We love Bowerbird Atelier’s fresh take on hand lettering in the invitation suite, menus, and cocktail sign, and the black and white create a bold graphic statement. 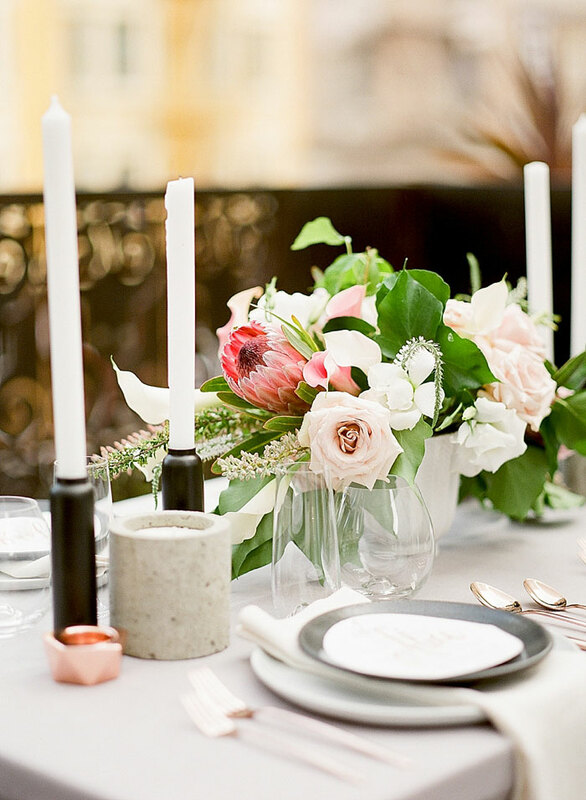 Candle holders were the perfect way to extend the palette of the tablescape and mix in texture and varying heights for greater visual impact. 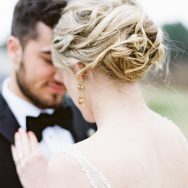 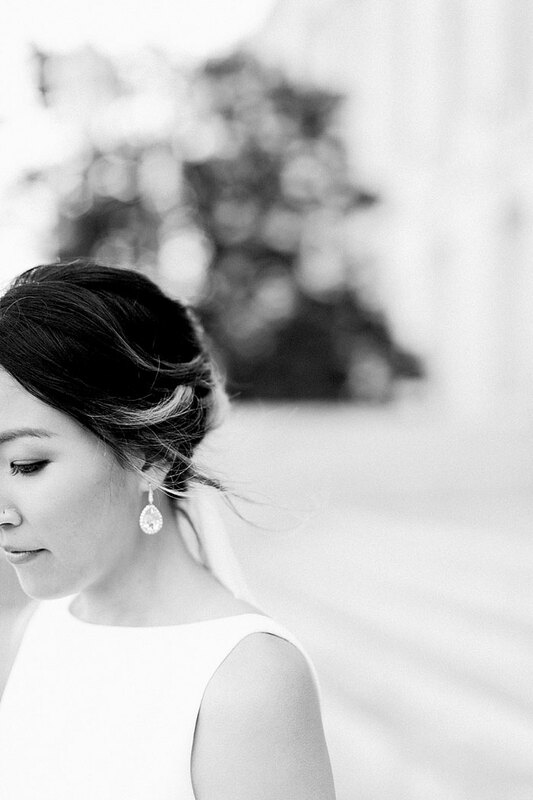 Imagi by Fiona created a natural beauty look for our lovely bride, with soft luminous makeup and a twisted updo that had perfectly loose escaping tendrils. 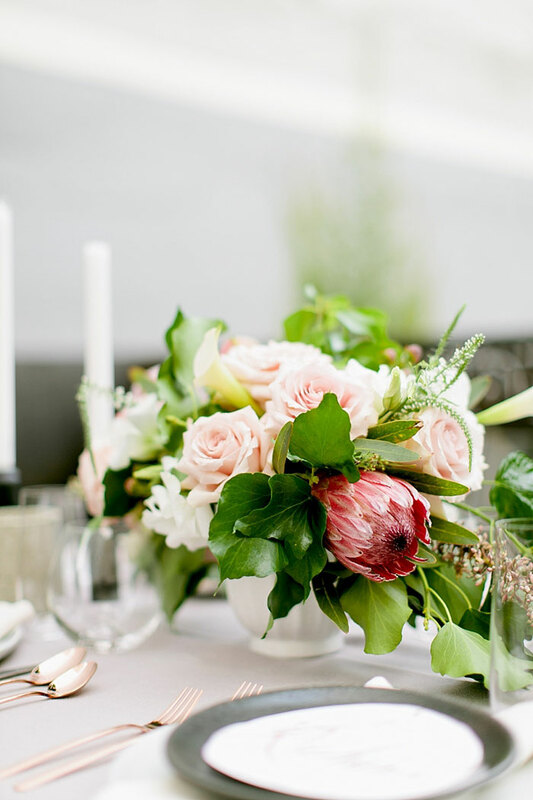 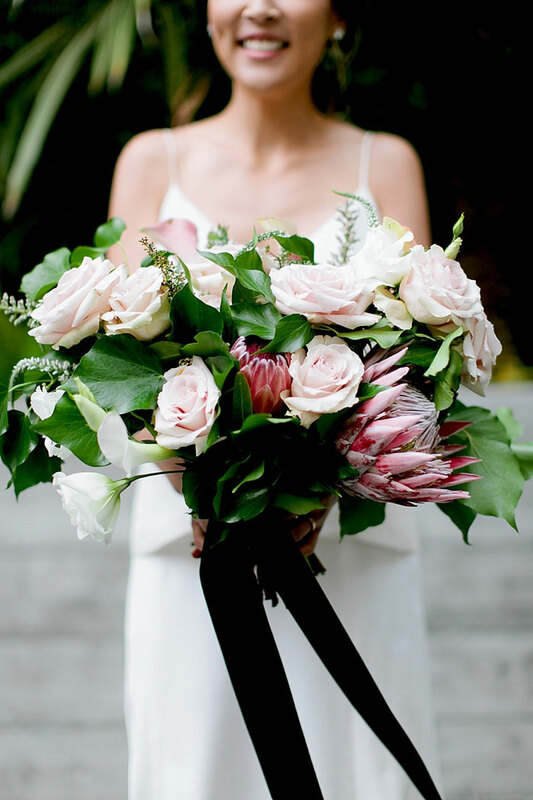 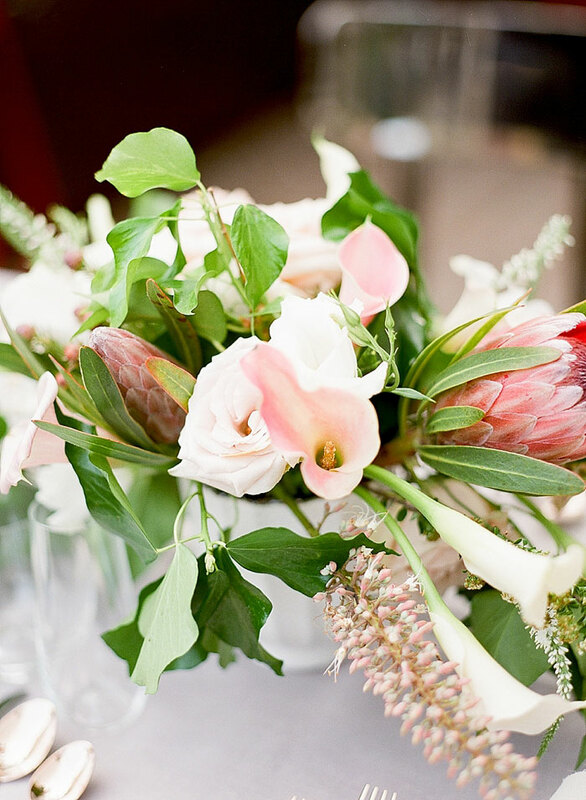 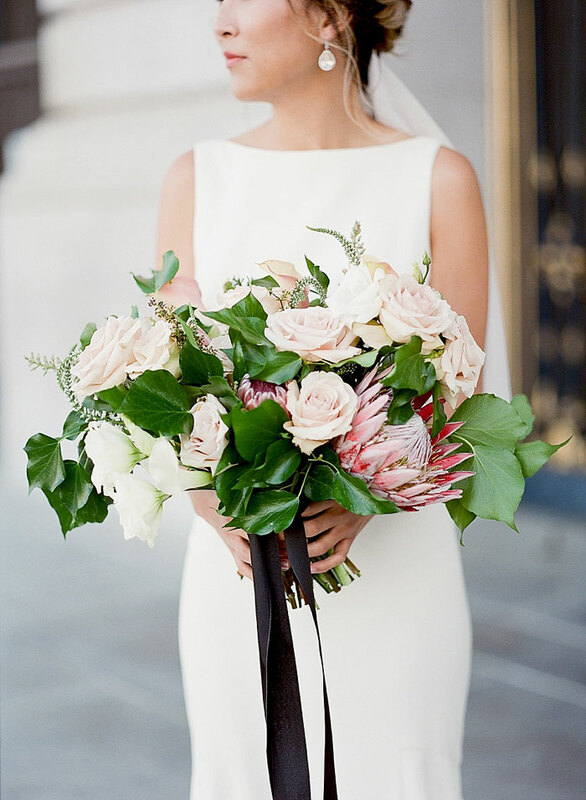 The bouquet and centerpiece created by Bloomwell have classic mainstays like full roses and lush greenery, but have a pop of surprise with large proteas. 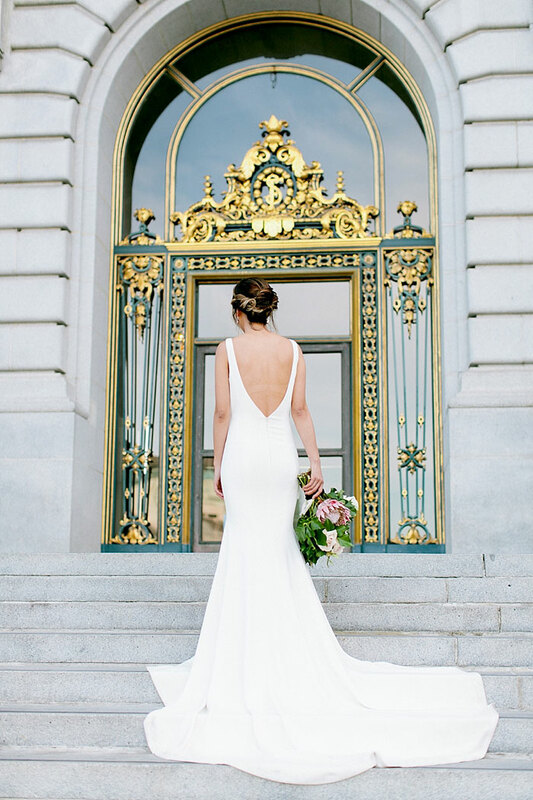 Both bridal gown looks from Lovely Bride San Francisco exuded two styles; The first one, while it is elegantly simple, the stunning train and low back make it a perfect pick for the minimalist bride who wants something special without opting for heaps of tulle. 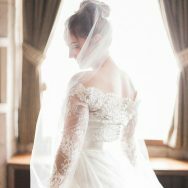 The second look was inspired by the current trend of bridal separates for an unfussy chic style.